Volunteering abroad is a great way to make the most of your travels, whether you’re on a gap year, holiday or career break. Our volunteers often merit their volunteering experience with us as the absolute highlight of their travels! Worldwide Experience’s diverse portfolio of meaningful projects offer the opportunity to settle into a local community, make friends, save money and above all help the environment and those in need of your efforts and skills. We offer such volunteering placements in several countries and all of our projects have similar conservation objectives and aims to ours. We support their initiatives through the recruitment of volunteers from around the world to work on diverse projects. With so many volunteering options out there, it can be overwhelming to decide which project to support. Start by browsing through our handpicked portfolio of projects and make a short list of ones that catch your interest. Then research the destinations to understand a bit more about your chosen project and what you’ll be able to do there when you’re not volunteering. Make sure the project matches what you have in mind for your travels. Give us a call, and our friendly and experienced team will gladly talk you through the projects you’re interested in and help place you with the project that’s best for you! • You will have an unforgettable experience! People often ask why they should have to pay for the opportunity to help others. You are in fact not paying to undertake voluntary work, you are paying for Worldwide Experience and our Project Partners to provide a framework for a safe, meaningful and structured programme. There are costs involved in hosting our volunteers, from costs like 24 hour volunteer support, administration and communication costs, financial protection of your money, programme inspections, transport, accommodation and meals, staff support and upkeep of facilities to mention a few. All of our gap year placement programmes have been formulated with the assistance of the Worldwide Experience team, to give you the best possible experience, wherever you may go. All projects are run by specialists in their field who are specifically trained to impart their skills and experience. While the success of any volunteering operation depends the presence of committed volunteers, our vital conservation and development work cannot be effectively achieved without expertise plus financial and administrative support. Volunteer fees are essential to help continue project work during quiet seasons when there is typically less volunteer support. 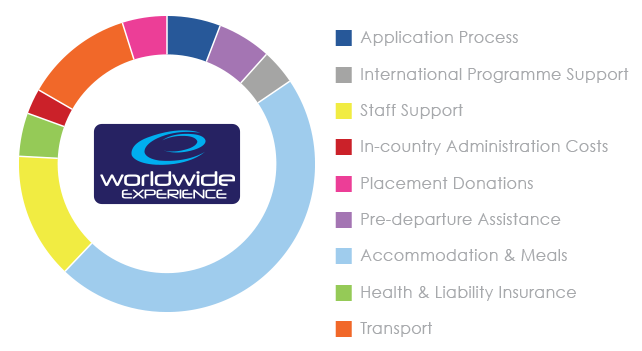 At Worldwide Experience one of our primary values is transparent volunteer fees, and the use of these fees towards providing structured volunteering experiences that actually make a difference.